Exterior view of the 10-story Jacobs Medical Center at UC San Diego Health. UC San Diego Health will open Jacobs Medical Center, a 245-bed medical and surgical specialty hospital, on November 20, 2016. Named in recognition of $100 million in gifts from Joan and Irwin Jacobs, the 10-story facility combines renowned physician-scientists and care teams, precision medicine, clinical trials and creative arts and culinary offerings to provide an extraordinary healing experience for patients and families. Designed by CannonDesign, and built by Kitchell, the $943 million, 509,500-square-foot facility represents the seamless integration of advanced imaging and surgical technologies with comforting environmental elements to speed healing. As the region’s only academic health system, patients will have access to leading experts, novel therapies, surgeries and treatment trials only available at UC San Diego Health. 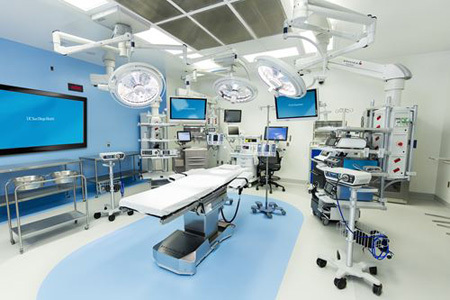 In operating rooms like this one in Jacobs Medical Center at UC San Diego Health, specially trained teams use advanced computer-guided imaging systems, lasers and robotics to enable complex surgical procedures. There are three specialty centers within Jacobs Medical Center: the Rady Pavilion for Women and Infants, the Pauline and Stanley Foster Pavilion for Cancer Care and the A. Vassiliadis Family Pavilion for Advanced Surgery. These pavilions will treat everything from single and multiple births to the most complex malignancies and chronic diseases. Maysent said patients at Jacobs Medical Center will have access to emerging stem cell and immunotherapy trials through Moores Cancer Center, the region’s only National Cancer Institute-designated Comprehensive Cancer Center. They will also have access to nearly 100 cancer subspecialists, plus dedicated support teams, such as respiratory therapists and pain management experts. Clinical services at Jacobs Medical Center are supported by a university-based genomics diagnostic team capable of analyzing hundreds of genes to help formulate optimal treatment plans for individual patients. Jacobs Medical Center is also supported by specialized services within the Center for Advanced Laboratory Medicine to isolate and modify human cells for treatment of multiple diseases. Patient rooms in Jacobs Medical Center at UC San Diego Health feature natural light, art and unique technology that allows patients to access medical records, read about care providers, and control light, climate and entertainment options. The majority of rooms at Jacobs Medical Center feature floor-to-ceiling windows with panoramic views of San Diego, from the mountains to the sea. 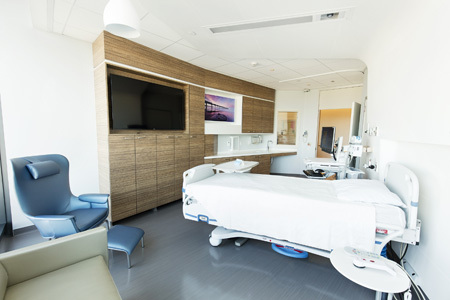 Inside each of these private rooms, patients will be able to use an iPad to control the room’s environment, such as lighting and temperature, as well as entertainment on their Apple TV. These iPads also allow patients to see photos and biographies of their clinical care team, when their next medical test is scheduled and access a bedside medical chart. This combination of technologies is industry-leading and not offered at other California hospitals. The Jacobs Healing Arts Collection has been conceived and created by Joan Jacobs, arts advocate and philanthropist. Her appreciation of the intersection of art and healing is incorporated into every space within the hospital, from hallways to patient rooms. It is represented by more than 150 individual art pieces, from paintings and sculptures to digital photographs and lithographs, from realism to nature to abstraction. Pieces by internationally renowned artists, such as Damian Hirst and Donald Sultan, are located in most frequently travelled areas of the hospital. Patients at Jacobs Medical Center will enjoy seasonal cooking from scratch. Through a personal room service attendant, they will be able to order from a restaurant-style menu that can be adapted to each person’s specific health needs and taste preferences. The menu is built around a heart-healthy diet with gourmet flair to make every meal healthy, delicious and well-presented. Meals are made to order, under the watchful eye of executive chef Rodney Fry, who previously worked at the Hotel Del Coronado and La Jolla Beach & Tennis Club. The idea is to provide patients with appealing, tasty fare created with locally sourced produce, antibiotic-free meats and plant-based protein options. With spectacular top floor views of La Jolla, mothers delivering at Jacobs Medical Center will have access to a neonatal intensive care unit (NICU), a birth center and a labor and delivery unit, all within one hospital — a combination unique on the West Coast. Whether a mother wants a midwife at hand and a next-day discharge or is giving birth to triplets and needs extensive NICU care, all patients have an array of safe birth choices in one location. On the sixth floor, UC San Diego Health will be the first hospital in California to offer an open floor with full-unit air filtration for bone and stem cell transplantation patients. The design allows patients freedom of movement, exercise and socialization, rather than confinement to a single room. A gym encourages patients to strengthen their lungs and muscles. On the second floor, surgery suites include intraoperative CT or MRI imaging capabilities, a first for San Diego. These technologies enable surgeons to perform immediate scans during surgery to verify complete tumor removal and the precise repair of neurologic, urologic, orthopedic and other conditions. Surgeons at Jacobs Medical Center will perform procedures not offered anywhere else in the region. For example, UC San Diego Health is the only hospital conducting laser ablation of brain tumors, living donor liver transplant and other complex surgeries for cancer care. Jacobs Medical Center was designed to connect to the other medical centers and research institutes of UC San Diego. 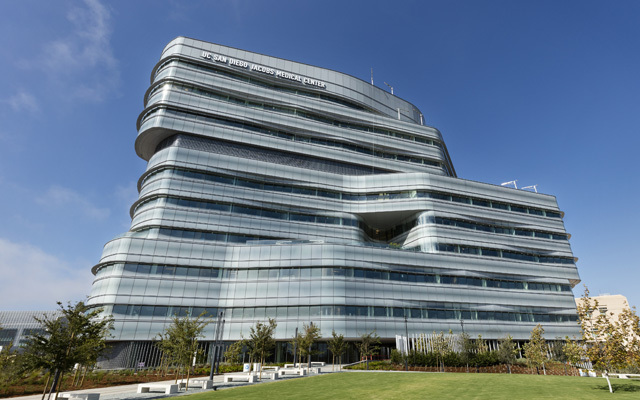 Jacobs Medical Center connects to the Thornton Pavilion and the Sulpizio Cardiovascular Center, with a bridge to the Altman Clinical Translational Research Institute, part of a national consortium of 60 medical research institutions created to energize bench-to-bedside efforts. Jacobs Medical Center is within walking distance of Moores Cancer Center, Shiley Eye Institute and a new Outpatient Pavilion, scheduled to open in 2017. Jacobs Medical Center was enabled by an outpouring of support from the entire community. In addition to the Jacobs, Foster, Rady and Vassiliadis families, UC San Diego expresses deep thanks to T. Denny Sanford, Sally B. and John M. Thornton, Mary and Gary West, Lisa and Steven R. Altman, Rita L. and Richard C. Atkinson, the Chodorow family, Miriam and Jerome Katzin, Diane M. Martin, Peggy and Peter G. Preuss, and Hannah and Eugene L. Step for their gifts and contributions. Special appreciation also goes to Iris Strauss and the arts committee. UC San Diego Health is the #1 ranked adult hospital in San Diego by US News & World Report. Ranked in eight specialties, the hospital is recognized among the top 50 hospitals in the nation. See a timeline of achievements over 50 years.